Kick A Rock: I Drink and I Know Things: Game of Thrones Sn 6, Ep 6 – "Blood of My Blood"
I Drink and I Know Things: Game of Thrones Sn 6, Ep 6 – "Blood of My Blood"
When all seemed lost for Bran and Meera they were saved by a Ringwraith. Wait, no... I'm getting this mixed up with my Lord of the Rings blog: Talking Tolkien. Anyway, their hero is a mysterious looking hooded figure on a black horse. He quickly disposes of the wights with a flaming ball-and-chain-and-scythe weapon, picks up Bran and Meera with one hand, and rides off to safety. Who is this badass on horseback you ask? Uncle Benjen Stark! He's back and better than ever! Well, aside from the whole "I was about to turn into a White Walker until the Children of the Forest stuck a piece of dragonglass in my heart which saved my life, but now I am cold like ALL the time which is annoying, but at least I got a cool flaming scythe thingy." In any case, he tells Bran that he has essentially become the new "Three-Eyed Raven" and that they must head south and prepare for the Night King's attack. It was interesting to see the Mad King in Bran's visions yelling, "Burn them all!" I really hope we'll get more to that story soon. A girl decides that she is Arya Stark after all. She comes very close to completing her assigned task, but ultimately cannot go through with it. Maybe she wanted to see if Lady Crane would take those acting notes and use them in the next show. This decision comes with great consequences as we find out that the Faceless Men have already put out a hit on Arya. She reunites with her old friend "Needle" and prepares for a showdown with her assassin, who may already be lurking somewhere in the shadows of Bravos. The Tyrell army arrives in King's Landing and we finally get our big battle with the Faith Militant! Wait... No we didn't. Instead it is revealed that the High Sparrow has fully manipulated King Tommen and for all intents and purposes is running the city. From a strategic standpoint I applaud the move. From a fan's standpoint... just fight it out already! Show me The Mountain! Tommen really botched this plan up for his family. It's almost like our king is just learning how to play checkers while everyone around him is using him as a pawn. He even fires Jaime from the Kingsguard and sends him to reclaim Riverrun. Good move, Tommen! You've just sacrificed your knight and allowed a bishop and a queen (I don't believe Margaery has atoned for a second) to move in for the kill. Checkmate. Walder Frey returns and is somehow even older and more crotchety than ever. Can we get some vengeance for the Starks this season please? How great would it be for Walder to get his own "Red Wedding?" The North remembers. Dany's dragon sense is tingling on the way back to Meereen. She leaves her khalasar on the back of her horse and flies back on the back of a dragon! 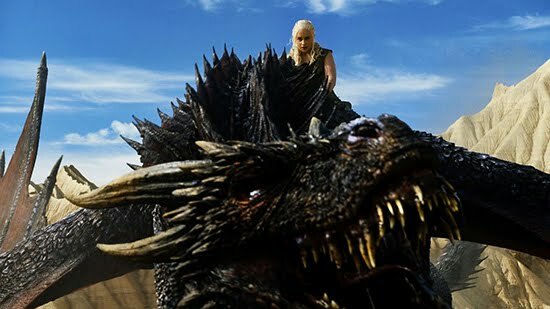 Drogon looks like he's been eating very well since we last saw him. Amazing what a steady diet of goat (and most likely Dany's horse as it did not return with her) can do for you. Using many of the same words that Khal Drogo once spoke, Dany rallies her troops and seems more determined to take the Iron Throne than ever. There's just that matter of getting back to Meereen first...and then dealing with the slavers...and possibly some red priests...and somehow acquiring roughly a thousand ships, but after that we are going to Westeros for sure! Whatever, she was on the back of a damn dragon! I really want a flaming chain-scythe thingy. Randyll Tarly is a douche, but does Sam really have it in him to fight his own father if it comes to it? I hope the pointy end of Needle finds its way to the Faceless girl before she finds her way to Arya. I think I would actually like to see that troupe of actors in Bravos recap every big event we've seen so far. I was wrong about Tommen. I only gave him three more episodes. He may have passed that, but I still don't see him making it to the end of this season. Cersei seems way too confident about her trial by combat. The High Sparrow is way too crafty to not have a plan to take out The Mountain. It sure seems like Margaery is playing him though, maybe he's not so crafty after all? The Brotherhood without Banners was mentioned in this episode. Just saying. Dany needs a thousand ships. Euron Greyjoy told his people to build him a thousand ships. We should see the significance of that by season 10 if all goes well. We had some interesting comments last week for the recap of "The Door." Terry Anders pointed out that Arya was playing herself in the audience and she once again had to relive her father's death and Tom McMahon rightfully called me out on not mentioning the origin of the White Walkers. Who was that guy before he became the Night King? Is that important? As usual thanks for reading and let me know your thoughts and theories in the comments. It looks like the Blackfish is back in next week's trailer below. I drink and I know things."